Welcome to the BattleofFranklin.net web site. My name is Kraig McNutt [tellinghistory at yahoo dot com]. 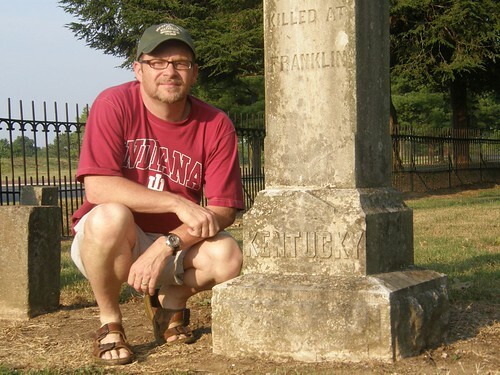 I’ve been blogging just on on Franklin now for over a decade and on the Civil War in general for over twenty years. This page focuses on the Battle of Franklin blog. To learn more about me visit this page. The primary focus of this blog is the (second) Battle of Franklin which took place November 30, 1864. However, one will find attention on a variety of other fairly related topics like places: Columbia, Spring Hill, Nashville, Murfreesboro, and of course Maury and Williamson County, TN. I frequently post content related to important people that drove the Civil War Franklin story like John Bell Hood, John Schofield, Jacob Dolson Cox, Patrick Cleburne, General John Adams, as well as lesser known but colorful personality like local civilians, the common soldier, and even civic figures. On the morning of November 30th Hood’s army continued its march north. Climbing Winstead and Breezy Hills astride the Columbia- Nashville Pike just south of Franklin, Hood was surprised to discover that Schofield remained in Franklin. The reason was the 800 wagons of the two Army Corps. There were three crossings of the Harpeth River at Franklin, a ford, a railroad bridge, and the remnants of a wagon bridge. The railroad bridge could not be crossed by horses and wagons until it was planked, the sides of the ford were steep and would have to be improved, and the wagon bridge would have to be reconstructed. Accordingly, Schofield had no choice but to defend Franklin until the wagon train could cross the Harpeth River. Schofield’s 30,000 men occupied entrenchments previously constructed on high ground south of Franklin, with both flanks anchored on the Harpeth River. They rapidly improved their works, adding headlogs and a formidable abatis. Hood’s combat experienced officers carefully viewed the Federal position and were impressed with its strength, so they were amazed when Hood issued orders for a general assault. As an alternative, Forrest proposed a flanking movement, but Hood was concerned that this would be his last chance to defeat Schofield in detail, before he could join with Thomas behind the fortifications of Nashville. Additionally, Hood was in no mood for flanking movements, as he believed in frontal assaults when facing such circumstances. At approximately 4:00 p.m. the Confederate advance began. Two brigades of Wagner’s division were lightly entrenched forward of the main Federal line and were both outnumbered and outflanked by the rebel main line. These brigades were badly broken, and were driven back in confusion to the Federal main line near the house of Fountain Carter. The Union soldiers occupying the main line were understandably loath to fire on their own men, and the result was that their lines were broken at the Carter House. For a brief, critical moment it appeared as if Hood’s assault would succeed, but a veteran brigade commanded by Ohio’s Colonel Emerson Opdycke smashed into the attackers around the Carter House, and drove them back in turn. Nowhere else did the Confederate soldiers achieve a breakthrough. The Federal fire was deadly accurate, heavy cannon emplaced in Fort Granger on a hill north of the Harpeth River swept the open fields, and the abatis was impenetrable. The attacks were bravely continued until long after dark, but the only accomplishment was the largest casualty rate of the war. Of Hood’s 20,000 infantrymen engaged, it has been estimated that nearly 7,000 were casualties. Schofield’s casualties were barely a third of Hood’s, being 2,326. By the end of November 30th, the Confederate Army of the Tennessee was no longer a cohesive, viable fighting force. Text credit: Franklin Battlefield Preservation Plan (n.d.): p. 8. Take a tour of the Battle of Franklin on Nov 30th with me!